Christie’s New York’s Magnificent Jewels auction, happening in April, will offer jewelry lovers a mix of lots spectacular and whimsical. The film garnered Walt Disney an honorary Oscar at the 11th Academy Awards and his wife, Lillian, wore a version of the bracelet to its premiere. 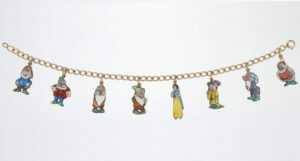 It depicts each of the seven dwarves and Snow White, and in 1937 would have retailed for $100. Today, Christie’s is predicting that it will fetch between $15,000 and $20,000. The limited-edition bauble is one of the jewels being offered from the estate of Jean Tailer, along with a ruby and diamond “zip” necklace from Van Cleef & Arpels that’s predicted to fetch between $150,000 and $250,000, as well as a diamond, emerald and sapphire jewelry set from the house that will garner between $100,000 and $150,000. Meanwhile, those on the hunt for spectacular diamonds won’t be disappointed at the Magnificent Jewels sale. 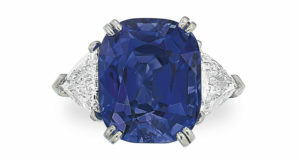 Headlining the jewelry auction is a twin-stone fancy vivid blue diamond ring. 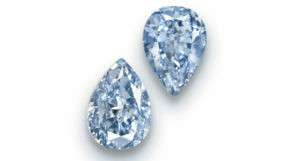 The magnificent pear-shaped stones weigh 3.06 and 2.61 carats, respectively. Mirroring the performance of other notable colored diamonds at auction, the ring is predicted to garner between $6 million and $8 million. 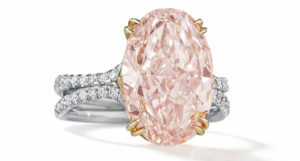 A special pink diamond will also be a draw, with a 6.11-carat oval-shaped fancy pink diamond ring predicted to sell for between $1.2 and $1.5 million. An array of spectacular yellow diamonds are up for grabs as well. A pair of fancy deep yellow diamond earrings—weighing 7.55 and 7.51 carats—should earn between $700,000 and $1 million; a fancy intense yellow diamond ring weighing 37.65 carats is estimated to earn between $600,000 and $800,000; and a fancy intense yellow diamond pendant weighing 35.06 carats is predicted to go for between $500,000 and $700,000. Not to be outdone by their colorful counterparts, a number of white diamonds are predicted to sell for $1 million or more. A 16.33-carat rectangular-cut, D-color, VVS1 clarity, potentially internally flawless Type IIa diamond ring is expected to sell for between $1.2 and $2.2 million; a 16.69-carat marquise cut D-color, VVS2 clarity, potentially internally flawless diamond ring should earn between $1.2 and $1.8 million; and a 17.08-carat square-cut, D-color, VVS2 clarity, Type IIa diamond ring is expected to garner between $750,000 and $1 million. Several private collections will offer signed pieces from the likes of Bulgari, Cartier, Harry Winston, Jean Schlumberger for Tiffany & Co. and Van Cleef & Arpels. From the collection of Florence and Herbert Irving come a Harry Winston Burma 9.73-carat ruby and diamond ring ($250,000-$350,000); a Bulgari 16.88-carat Madagascar sapphire and diamond ring ($70,000-$100,000); and a Bulgari sapphire and diamond necklace ($100,000-$150,000). 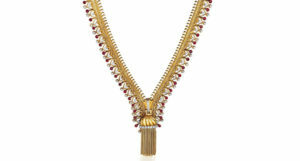 Notable works from contemporary jewelers will also make an appearance at the April sale. A multi-gem and diamond pair of earrings from Carnet predicted to garner $30,000-$50,000 will be accompanied by an advance copy of “Carnet by Michelle Ong,” published by Thames and Hudson. 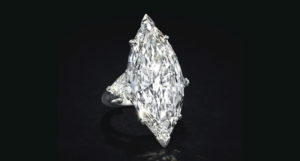 The Magnificent Jewels live auction will take place in New York on April 16 and be available for viewing April 12-15. It’s already made stops in Los Angeles and Basel and will head to Hong Kong on March 30. Christie’s is concurrently holding its “Jewels Online” sale, with offerings from Bulgari, Cartier, David Webb, Tiffany & Co. and Van Cleef & Arpels. It also offers the second part of “The Private Collection of Stuart and Cindy Tietze-Hodosh,” which is one of the largest known collections of Mexican jewelry.